Research shows that founder-led companies outperform. While that might not be surprising given the recent share price performance of US tech titans such as Amazon, Alphabet, Netflix and Facebook, which are led by their founders, research shows that this phenomenon isn’t limited to the technology sector (see charts below). Inside-owners are often more entrepreneurial and aren’t afraid to do something different if it makes financial sense. They’re also smart about acquisitions. They don’t bet the company and are typically buying valuable assets in downturns while their contemporaries are busy fortifying their balance sheets. According to research by von Lilienfeld-Toal and Ruenz, ‘The acquisition activity of firms with high ownership is significantly lower than that of low ownership firms… Overall, these findings suggest that high ownership firms engage less in empire building’. 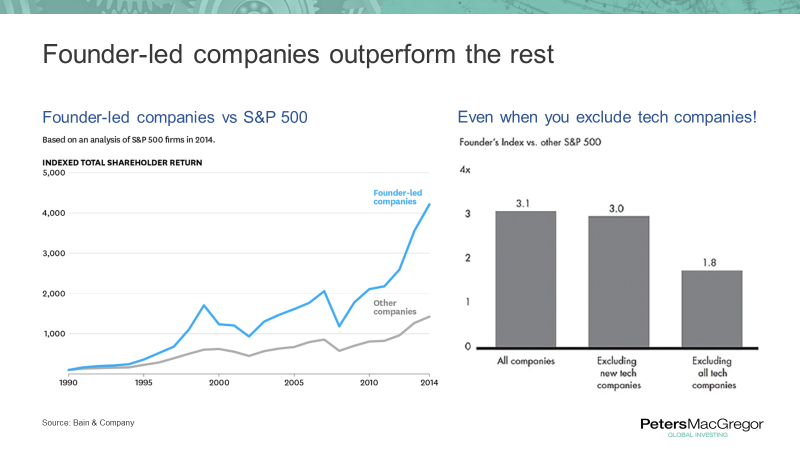 A study by Bain & Company a couple of years ago examined the performance of founder led companies v S&P 500 index and the results were compelling (see Figure 1). ‘The man who does not work for the love of work, but only for money, is likely to neither make money nor find much fun in life.’ In short, they work because they enjoy it. Let’s now examine two owner-managers that feature in our portfolio and one great Australian success story. John Malone is the doyen of the US cable TV industry and the lead protagonist in the book Cable Cowboy. 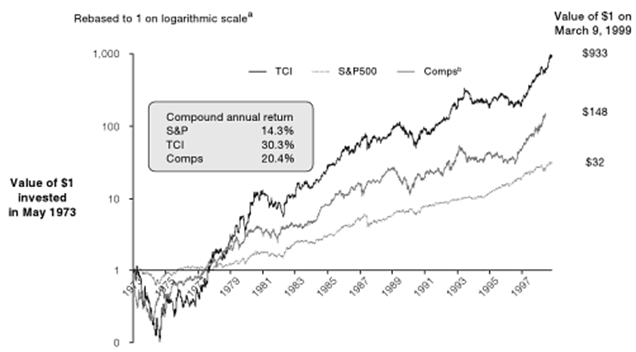 He produced 30 per cent annualised returns as CEO of TCI between 1973 and 1999 (twice that of the S&P500 – see Figure 2 below) before selling the company at the height of the tech boom to AT&T. From the ashes of the tech wreck that followed, Mr Malone emerged with a large stake in Liberty Media, which spawned numerous companies with interests in cable TV content and distribution, satellite radio and broadband internet, just to name a few. We own several Liberty names with businesses diversified by industry and geography. They don’t typically screen well due to a host of factors. Management focuses on maximising free cashflow to buy back shares rather than reporting high current profits that attract high taxes, for example, which depresses return on equity even though the company produces high cash returns on investment. As complications like this keep most investors away despite management’s remarkable track record, we’ve no problem taking advantage of the discounts overlooked by others. Instead of dangerously leveraging the balance sheet to accumulate land for development, NVR lays down 10 per cent of the purchase price for an option on future development. This means the balance sheet isn’t highly geared, allowing the company to buy back 75 per cent of its shares on issue over the past 20 years. That’s a remarkable feat for any company, yet alone a home builder. In 2009 NVR was the only listed US homebuilder to make a profit and post respectable shareholder returns through the GFC (see Figure 3). With US housing stock now reaching record lows, interest rates still low and the Millennial population – the country’s largest ever – reaching a median age that suggests they’ll soon start having families of their own, the company is well placed to benefit from an increase in homebuilding. If housing doesn’t pick up, we expect the company to buy back plenty more shares. Tony Brown is the founder of four-wheel drive accessories business ARB Corporation. Mr Brown grew so tired of parts and accessories on his four-wheel drive breaking under duress that he decided to manufacture his own, including bull bars, old man emu shockers and air lockers, among many others. If you’d bought shares at one dollar in 1999, not only would your investment have multiplied by 22 times since then, but you would’ve collected almost $7 in dividends. ARB has regularly paid special dividends as well, showing that the company has not only dominated its niche but is also shareholder friendly. You’ll often discover rare traits shared among owner-led businesses. One example is having net cash on the balance sheet. As Mr Brown is interested in managing ARB for the long term, and because there is no risk of ARB being taken over due to the high family insider ownership, Brown takes no risk with the company’s finances. That means the company is never under financial stress, even during a recession, and it makes the company’s ungeared historical return on equity of over 20 per cent even more impressive. 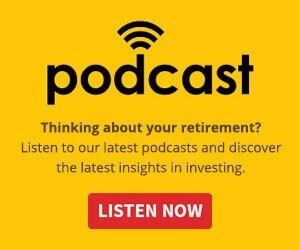 Even if you had paid the highest price for ARB prior to the GFC, you still would’ve earned an annualised return of well over 20 per cent. It proves that even in expensive markets like today’s, you can still find value in good businesses if you’re prepared to own them over long periods. In an environment where revenue growth is harder to come by, we believe entrepreneurial managers are worth their weight in gold, as they adapt to keep their businesses growing. Our job is to keep partnering with these talented individuals so that your savings continue to grow alongside theirs. 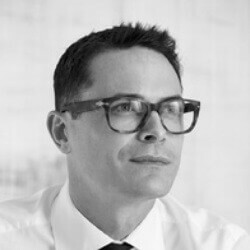 Nathan Bell is head of research at Sydney-based, global fund manager, Peters MacGregor Capital Management.